 Seventh President of America (1829-1837) Born into a poor family, Jackson represented the "candidate of the people." His supporters became known as democrats. He helped initiate the spoils system (the practice of appointing people based on party loyalty) by ousting many government employees and appointed his followers. His early life was notable for violent quarrels, once killed a man while dueling. His most obvious trait was his force of will, a characteristic that allowed him to show quick and firm judgment. He lack training and education, and was attacked for his inability to "compose a correct sentence or spell words of four syllables."  Jackson appealed to the common people as he represented what Americans could do given the chance. His background allowed him to understand the values that many common people regarded with favor. During his administration, presidential power increased, the American definition of democracy broadened, and people began to expect more from their government. Being a Westerner, he distrusted banks which was evident when he vetoed the Recharter Bill. He justified his decision by stating what many people disliked about the Bank of the United States- that it made "the rich richer, and the potent more powerful" It was his understanding of the common people that led him to his reelection in 1832. 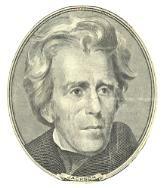 Shortly after reelection, Jackson proposed to destroy the Bank. However, the bank changed its hated policies and began to extend easy credits to state banks. Andrew Jackson could be seen as either a traitor or a patriot, according to James Parton, his first biographer. "He was one of the greatest generals and wholly ignorant of the art of war. A writer, brilliant elegant, eloquent, without being able to compose a correct sentence or spell words of four syllables...A democratic autocrat. An urban savage. An atrocious saint." During the reception after his inauguration, the crowd outside the White House pushed in and smashed chairs and china. Jackson had to escape through a back window. These events seemed to justify the prediction that Jackson's election would mean the reign of "King Mob." What did Jackson attempt to accomplish shortly after being elected? Give funds from taxation to "pet banks"